A look down the shooting line. The 2018 Pyramyd Air Cup has come and gone, and I find myself sitting at a computer for the fifth time trying to find the words to describe it all to you. The amount of support we have gained over the years continues to amaze me. We do our best to put on a first class event within the space and time we have to do so, and I believe we achieve that. But to have that affirmed by our attendees and competitors means the world to us. Eric Jones steadies himself with his trusty Diana 54. As I do every year, I want to thank all of the competitors, across all of the events that came out and spent their weekend with us. With over 104 competitors between the two events that signed up this year, and a lengthy waiting list, we must be doing something right! I also need to say a huge thank you to my fellow Pyramyd Air staff members that dedicate their time to the event. Taking time away from your personal lives and families is greatly appreciated, and I cannot thank you enough. A special thank you to Kristen Coss and Jeff Paddock. For those that still don’t know, Kristen is really the engine behind the event. I take over once we are on site at Tusco Rifle Club, but Kristen drives everything that happens before the Cup and keeps the wheels turning while the competition is running. Kristen deserves the bulk of the credit for the event going as well as it does and the attendees enjoying themselves. Jeff Paddock also has my sincerest thanks and appreciation. For those that don’t know, Jeff chose not to shoot the Cup this year and offered to help me run things on the firing line during the FT match. His help kept me sane, and kept me from being completely sleepless every evening, thank you buddy! Last, but certainly not least, thank you to all of the amazing vendors and manufacturers that supported the event. Many were on site for the event this year, and many more donated prizes and raffle items. 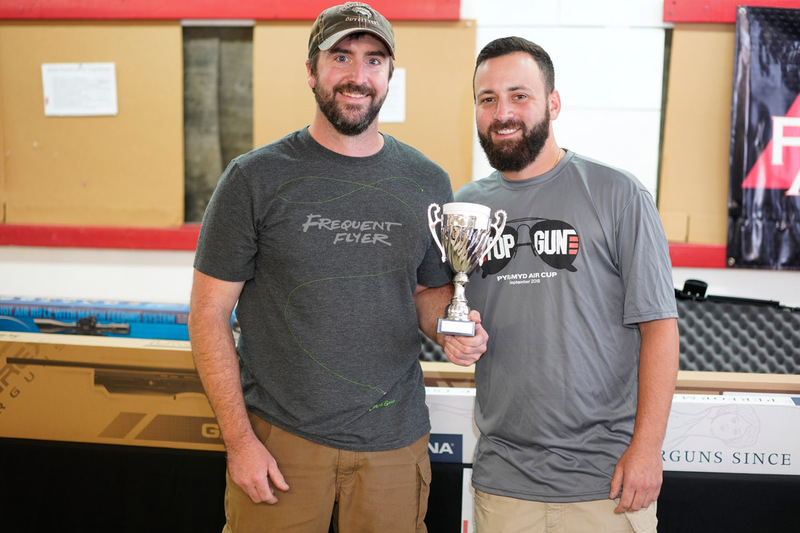 We are fortunate to have so many great partners that help make the Cup a premier airgunning experience. 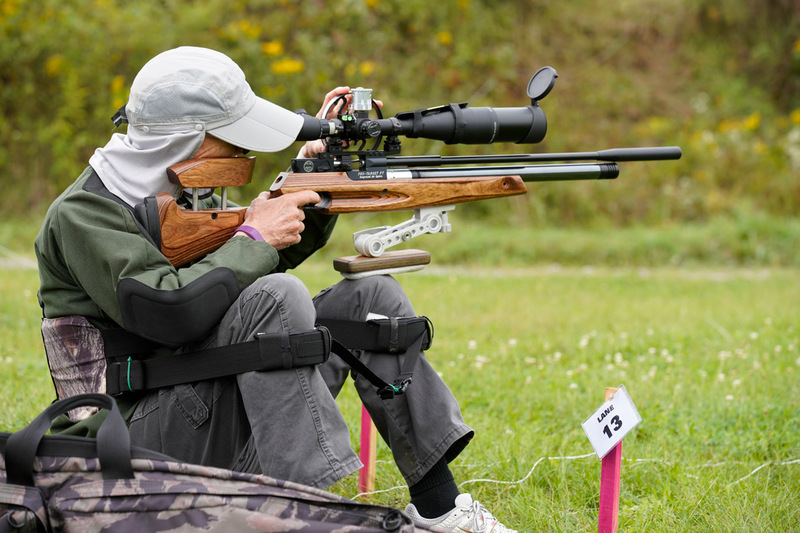 Yvonne Hsieh from Team Leapers sporting a new scope we have yet to see on top of her Air Arms TX200. I will be up front in telling all of you that this year was a bit more difficult than years past for us. Tusco Rifle Club granted us the use of less space than years past which made things very tight on the sight in line and demo lane. Thankfully, the competition space would be relatively unchanged, which allows for us to keep the FT and Gunslynger in one central location. When we arrived on Thursday to set everything up, we were greeted with temps in the high 80s. Moving cinder blocks, bricks and targets around in the heat and sun was rough to say the least, but I had a ton of good help and we managed to get everything done by around 5pm. With just a few tree targets to mount the next day, the weekend was starting out on a good foot. Zach Harde came all the way from Canada with his custom HW97 for the Cup! Sadly, we had to call the Pistol FT match off earlier in the week due to the threat of thunderstorms on Friday afternoon. Friday arrived and competitors steadily streamed in to check in and sight in. It was much more relaxed than in years past, due to the absence of any competition on Friday. Personally, I prefer this more laid back Friday schedule. 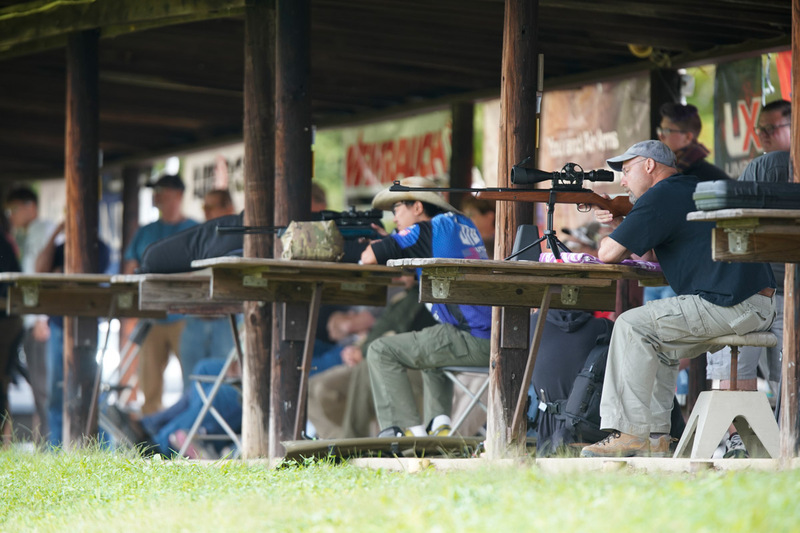 It gives folks time to talk, catch up, try products and other guns and meet new people. I spent most of the day behind the check in table, making sure everyone was accounted for and logging any equipment changes for the shooters. We wrapped up in the early afternoon, and began squadding the FT shoot for the next day. With the thunderstorms that were scheduled still looking like they were coming in full force, I had my fingers crossed hoping the targets and course would be relatively untouched. We made it to the range just as the sun was making its way up on Saturday morning to find the course in good shape, but very wet. For some reason, Tusco hadn’t cut the grass on the range in probably a week or two, and that coupled with the water saturated ground made my feet wet almost immediately. I reapplied WD40 to as many targets as I could, and headed back to the clubhouse to continue to prepare for the shooters meeting. We got started around 8:30 AM, and after the shooters meeting, the squads were called and the shooters hit the course. The first 10-15 minutes of a match are always the most nerve racking for me. 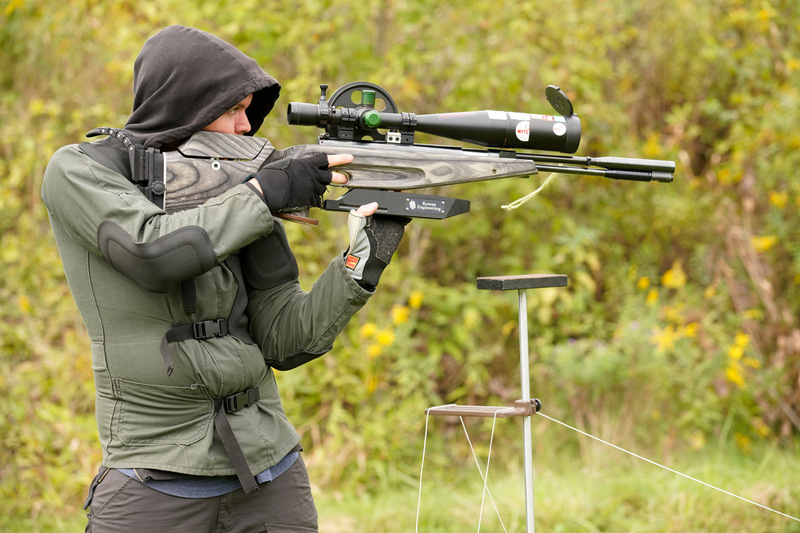 If there is a catastrophic target problem, the first squad on a lane will normally discover it. Thankfully, I heard no protests or target issues for quite a while, just a lot of people messing up their score cards! I believe there were 3-4 cold lines for the day. One target actually broke, so we replaced that, and we had a few strings get shot as well. These things happen, no big deal. They’re usually pretty quick fixes as well. 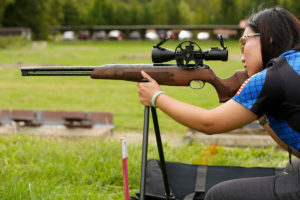 We did have one target with some intermittent issues because of a mounting problem, which was credited to all shooters. 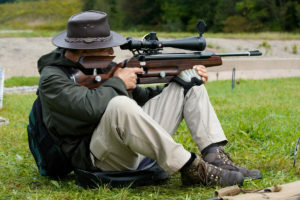 Roger Barker shooting an Air Arms Pro Target. The courses were set around a 30.5T and 31T respectively before wind is factored in. I know the wind was pretty tough that first day just by the scores. Some of the top shooters had missed more shots than you’d normally see them miss at other matches, and that’s typically due to the unusual wind at Tusco. George Harde and Nathan Thomas turned in 36/52 scores to tie atop the WFTF Piston standings. Greg Shirhall and Curtis Miller also finished tied after day one with 35s in Hunter Piston. In WFTF PCP, Jerry LaRocca stood tall with a 46, boasting a two shot lead over Manual Morales and Greg Sauve. Will Piatt dominated the day with a 48 in Open PCP, four shots better than next closest finisher Gary Palinkas. And in Hunter PCP, our biggest class, Sean McDaniel and John Eroh finished tied at 43. The scores were pretty tight and it would set the stage for a tense Sunday! 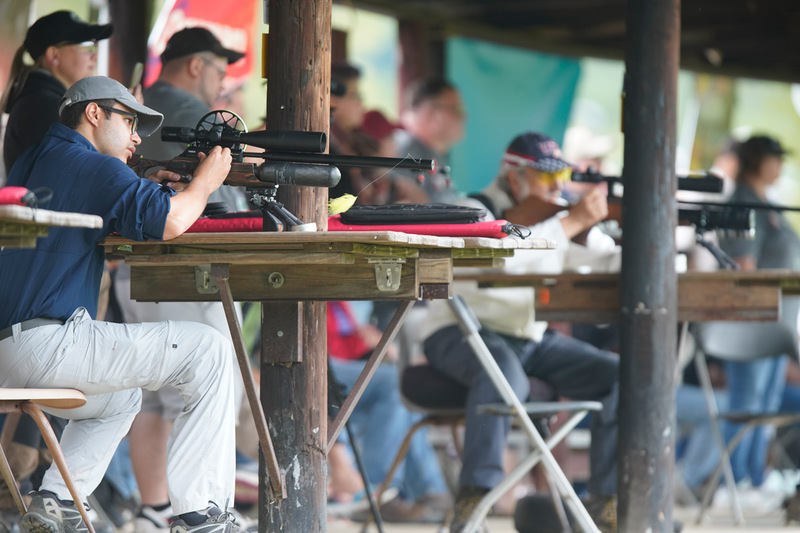 John Eroh shot his Air Arms S500 to a tie for 1st place in Hunter PCP at the end of day one. 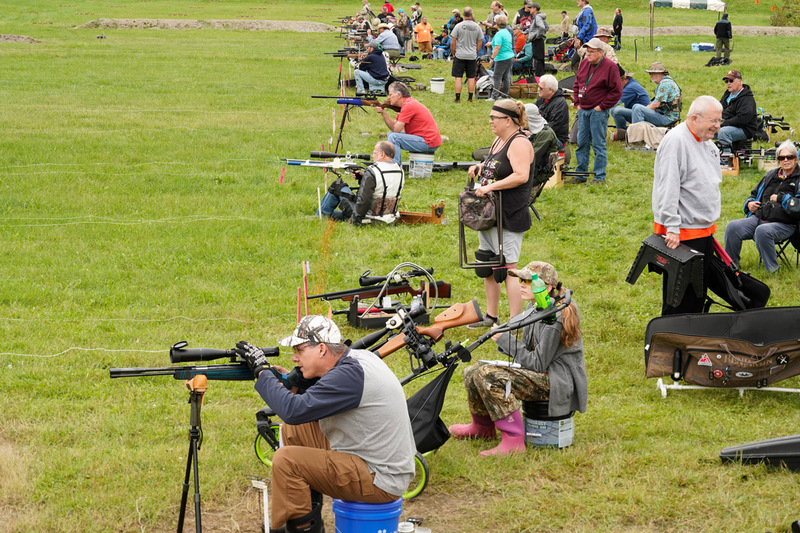 Once all shooters were off of the course, we turned our attention to the Gunslynger competition. The fast paced action is a lot of fun to watch, so we always get a pretty big turn out of spectators that want to check out the shoot. This year was no exception. 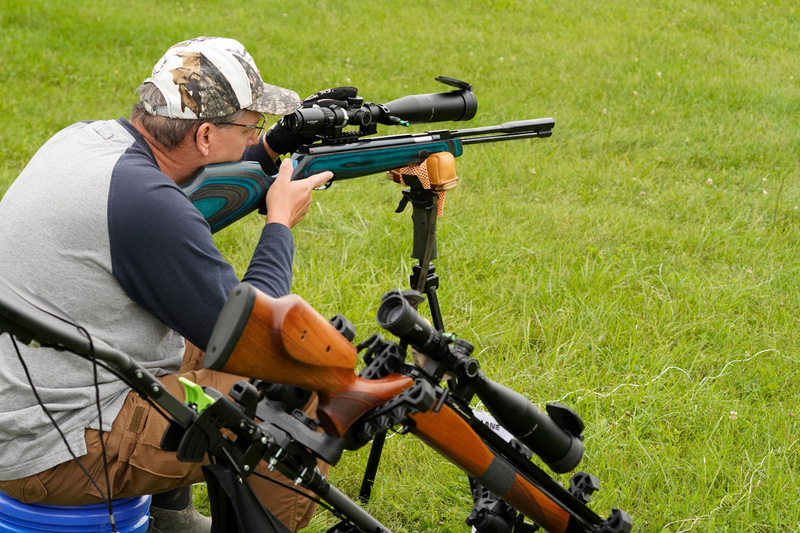 We started with the spring piston shooters, and we had a full 16 shooter draw. I was on the line judging one of the match ups during the first round (we had 5 match ups running at once, 10 total shooting lanes) and heard a competitor yell “Done!” very quickly. This was Bill Rabbitt, the 2017 PCP Gunslynger champ. He has decided to take on the challenge of a springer this year, and entered both PCP and Springer Gunslynger brackets…and clearly he meant business. The usual faces worked their way through the draw. I watched a real nail biter between Eric Brewer and Hector Medina Gomez in the first round that came down to the last target. It was stressful to watch, and it’s the reason the Gunslynger is so exciting! We stopped the Springer bracket at the semi-finals with Hector facing off against Jeff Swartz and Bill taking on Ming Qian (from Team Leapers) on Sunday. Jeff Swartz and Ming Qian battling it out for 3rd place in the Springer Gunslynger. Turning to the PCP Gunslynger, I knew we were about to see some really fast shooting! We had 25 competitors raring to go, we had 40 shooters signed up but many dropped out due to the long day of FT draining their energy. 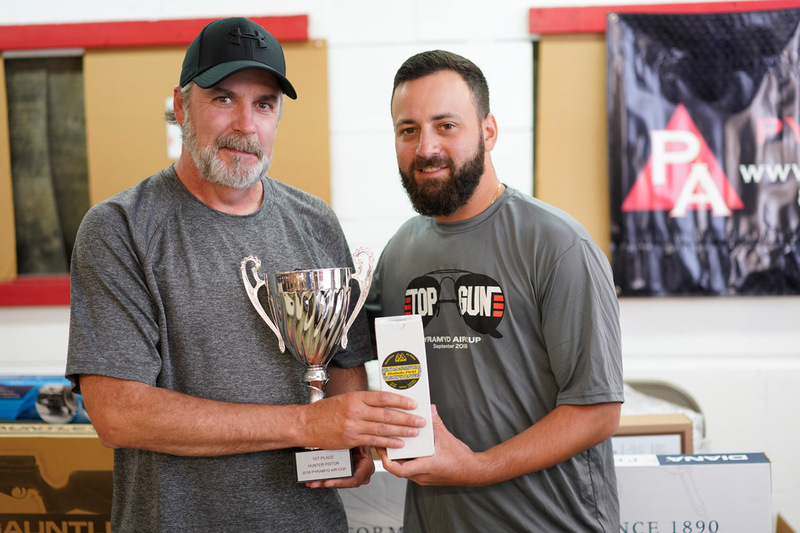 Last years finalists Bill Rabbitt and Greg Sauve certainly made themselves known immediately, quickly working through their early opponents. Familiar face Nic Gregoris also made his way through the draw pretty handily. Our last semi-finalist was Camden Meyer, who shot very well on his way to a semi-final spot. With our semi-final matches set, we called it a day and prepared for the banquet that evening. The banquet is always a great time, as it gives everyone an opportunity to break bread together and have a little fun away from the lanes. We also have some awesome raffles to take part in. 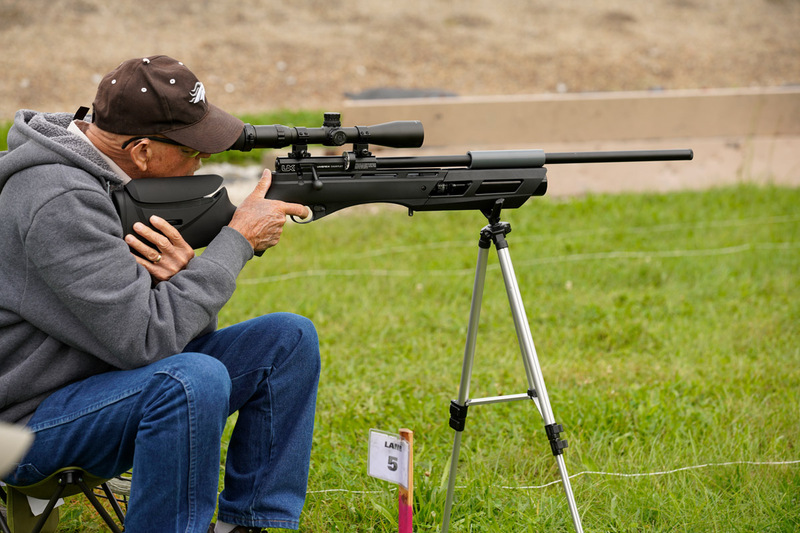 This year included rifles and pistols from SIG Sauer, Umarex and Gamo and scopes from Hawke. But the big prize was the Air Venturi 4500 psi compressor! Drinks were had, money was spent, raffle prizes were awarded, it was a fantastic time. 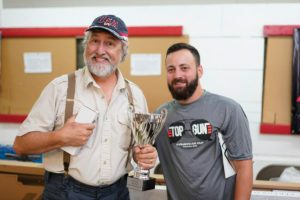 As the competitors headed back to their respective lodging locations, the attention turned to Sunday’s shooting as many of the shooters had the opportunity to take home some awesome prizes and bragging rights for the year. 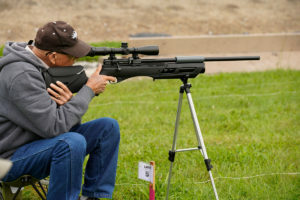 Hector Medina Gomez and his custom stocked Diana 54 shooting at just under 12 FPE. We arrived at the range before the sun was up on Sunday morning. I spent some time checking targets and making sure everything was still in line from the previous day. The targets were re-painted after the match on Saturday, so that was not an issue. But there was a lot of moisture on the targets and blocks, so I tried to remove what I could and verify function of the targets themselves. 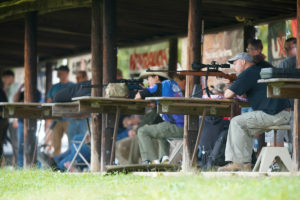 With that done and shooters coming off of the sight in range, we started the shooters meeting. We had much less to go over, but one thing I did make sure to touch on was how to properly mark your scorecard. The amount of times I was called over to correct a scorecard on day one numbered into the twenties, which was a little ridiculous. 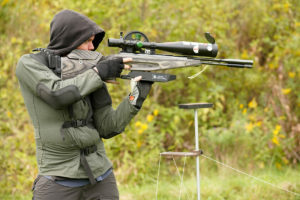 So we had a little fun with the shooters, and Kristen did a wonderful job demonstrating the proper markings for a hit (an X) and a miss (a O). We had a little laugh, and called the squads to get the shooters on their way. Dan Putz with his blue laminate HW97. The match went pretty smoothly for the most part. The wind was much more subtle than the day before, so I figured we would see many scores improve. Personally, I was closely watching the Hunter PCP shooters to see who would rise to the top by the end of the match. Sean McDaniel and John Eroh were battling it out with a few shooters just behind them, so I’m sure the nerves were high. As the day wore on, you could tell just by looking who was doing well and who wasn’t. That doesn’t stop most folks from enjoying their fellow shooters company though. Even when you’re not shooting your best, FT is a lot of fun and you are typically in great company. It’s a shooting discipline like no other in that regard. Many of the RSO’s who have been working the event for years now came up to me and stated how different FT is from all of the other competitions they work. Most said how surprised they were by the camaraderie, which is something most FT shooters are well aware of, after all…it’s one of the main reasons most of us continue shooting. 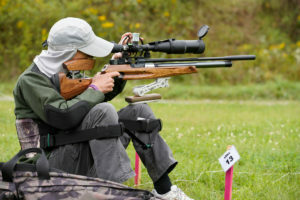 It’s one of the few competitive activities I’ve seen where shooters will actually try to help a fellow competitor, even when it may cost them a win for the day. When the day came to an end and the scores were tallied, Sean McDaniel ended up taking first place in Hunter PCP with an 88/104. In Hunter Piston, Greg Shirhall posted a 71, edging out Dan Putz by just one shot for the win. 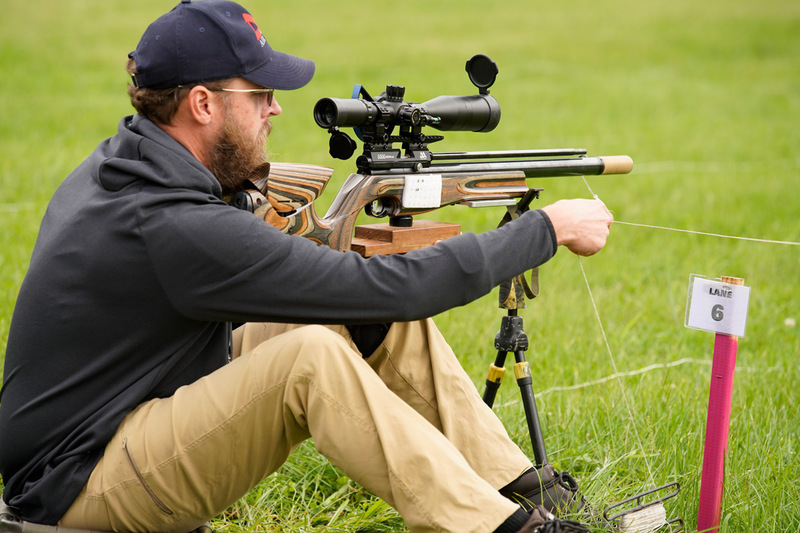 In Open PCP, Will Piatt blew past his competition dropping just 6 shots overall, and posting a 98! Incredible shooting Will. And in WFTF Piston, Nathan Thomas took the top spot with a 78. There were two shootoffs, one for 1st/2nd in WFTF PCP between Greg Sauve and Jerry LaRocca and another between George Harde and Leo Gonzales for 2nd/3rd in WFTF Piston. But first, we needed to wrap up the Gunslynger! First time shooter Dallas Anderson with his Umarex Gauntlet. The Springer bracket was finished off first with Jeff Swartz falling in a back and forth battle to Hector Medina Gomez. Bill Rabbitt was able to keep up his quick pace with his HW97 .22 and take the win over Ming Qian to clinch his place in the final. Ming ended up winning his 3rd place showdown with Jeff to take home the $250 prize for 3rd. Then the attention turned to the final, with Bill squaring off against Hector. The newbie versus the veteran. Outside of their experience with piston guns being a contrasting factor, they also chose to shoot two different ways. 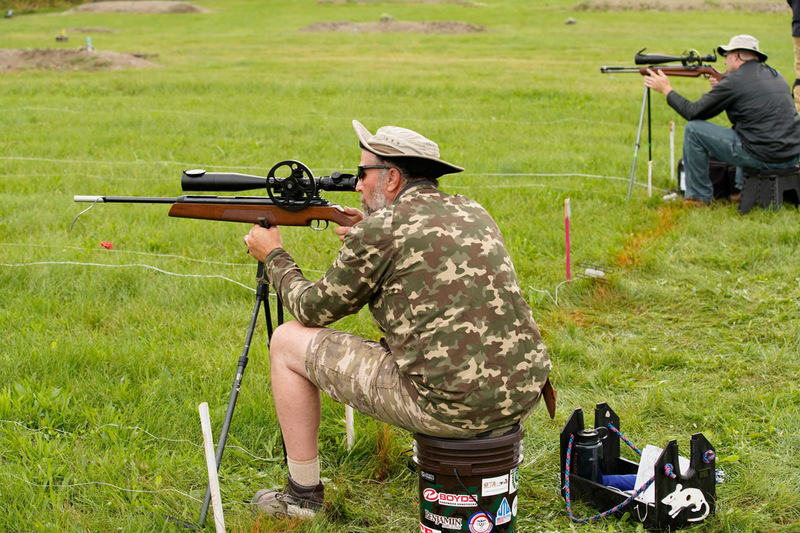 Hector shot off of his knee in a field target style position, while Bill shot from the bench. Bill ended up taking the crown with a good showing, winning the $1000 grand prize! He quickly had to turn his attention to the PCP draw, as he still had work to do there. He made relatively quick work of his semi-final opponent Nic Gregoris, while Greg Sauve bested Camden Meyer to move onto the finals. The 3rd place match between Nic and Camden was a good one, and Camden came out the victor to take the $250 prize. Then, for the third year in a row, Greg and Bill stepped to the line in the PCP finals. Each having bested the other once, this was the rubber match…I think everyone present was anxious to see what would happen. From the moment the match started, it was tight. Bill starting on the rams at the back, and Greg starting with the chickens at front. Greg got a bit of good fortune as one of his chickens ended up colliding with another to take out two with one shot. This blessing ended up being a curse, as he spent a few extra seconds looking for the other chicken before realizing what had happened. This gave Bill the breathing room he needed to pull ahead, and he stayed there, going on to win the round and take home a second $1000 prize! It was a lot of fun to watch, and congrats to all of the prize winners! Camden Meyer and Greg Sauve in the PCP Gunslynger Semi-Finals. I called the shooters for the FT shootoffs back onto the course, and we set a lane with a 1” KZ at around 30-31 yards, and a 1.5” around 50 yards. 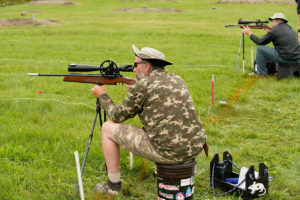 The shooters would start on the close target, if both hit it, they would move to the far target. We started from the seated position, and would work our way to kneeling, then standing if necessary. Greg and Jerry sat down first. Both hit the close target without an issue, and proceeded to miss the far target on their first attempts. 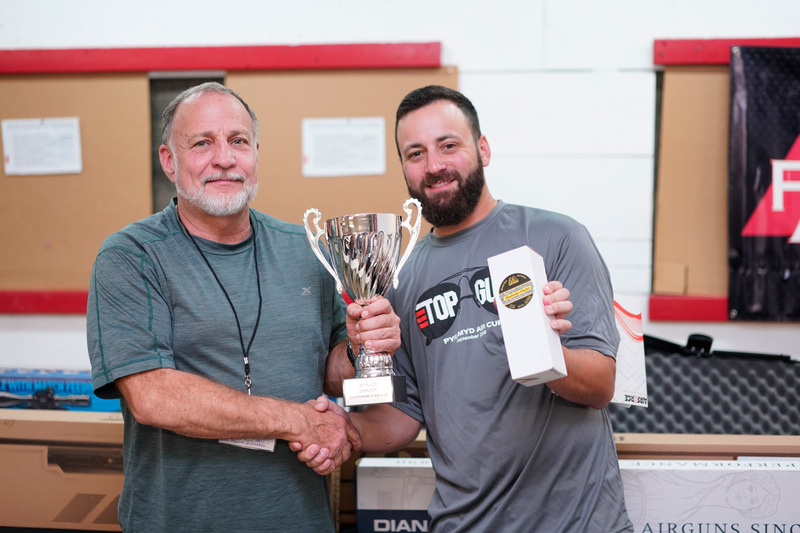 On the second try at the far target, Greg was able to take it down and Jerry could not match, meaning Greg was our WFTF PCP champion! Then Leo and George took the lane for the fate of 2nd/3rd in WFTF Piston. They went shot for shot, hit for hit, miss for miss for the first 3-4 shots, until they both took down the 50 yard full size KZ and we moved to kneeling. 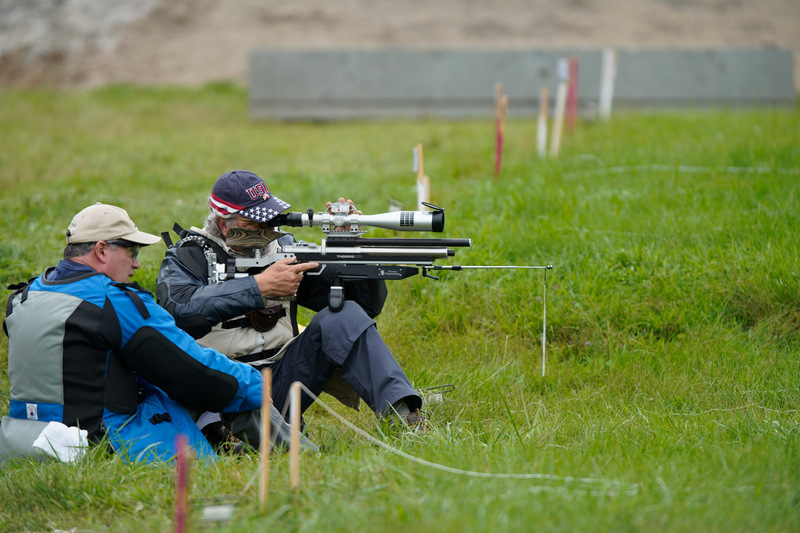 Leo was able to take the 1” target down which George could not match, giving Leo 2nd place. Nothing like a little drama to end the shooting with! 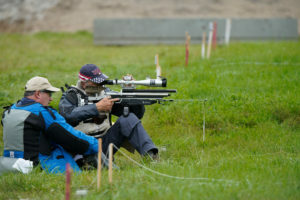 Greg Sauve takes aim during his shootoff with Jerry LaRocca. We returned to the clubhouse and began with the awards and prizes. For those that don’t know, we take all of the 1st, 2nd and 3rd place finishers and have them select numbers from a hat for their drawing positions for prizes. And let me tell you, we had some really awesome prizes this year! An FWB 800 FT, Air Arms FTP900, Ataman M2S FT, Hammerli AR20 FT, the new SIG ASP20 breakbarrel w/ scope and many many more. In total, I believe there was around $20,000 in cash and prizes awarded to winners in both FT and Gunslynger through the weekend. Kristen really did an amazing job of coordinating all of the vendor support we received this year. So again, a big THANKS to Kristen and to all of the manufacturers and vendors that donated prizes for the competitors. I think I say the same thing every year at the closing of the event, because it’s very true. That is, without all of our great customers and competitors, we would not be able to host such an event. So thank you to all of you that spent your weekend with us. The Cup is very much a labor of love for me, and on top of the mixed bag of emotions it brings out in me, I am left every year humbled to have the opportunity to work this event. Humbled by the support the event has received and even more humbled by the growth the event has experienced since the start. Your support means the world to me, and to the company. We will press on trying to make the next Cup bigger and better than ever, we hope to see you all there! Until next time, shoot safe and we will see you on the lanes! Complete scores below! Greg Shirhall with his 1st Place Hunter Piston Cup! 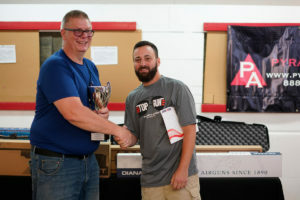 Nathan Thomas took 1st place in WFTF Piston. Greg Sauve, WFTF PCP Champ! 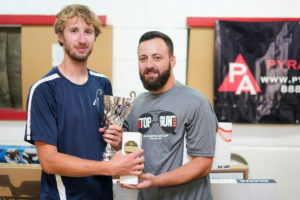 Open PCP Champion, Will Piatt, dropped just 6 shots for the title. Hunter PCP Champ, Sean McDaniel.